One note directly from their web site caught my attention. For the 1972-73 cruise, this aircraft also bore the name of VF-143's XO, CDR Harley Hall, who sadly become the last Navy combat loss on 27 January 1973 flying Taproom 113 and last American to be listed as POW. While his RIO was later released, there is still controversy and contradictions surrounding the ultimate fate of CDR Hall. CDR Hall was previously Blue Angels Officer-In-Charge/Flight Leader (Plane 1), he and his Blue Angel team were featured in the 1975 documentary Threshold - "The Blue Angel Experience." One of the first things you note about all AOA decals is the depth of the research and passion which they devote to it. Let's take a look in the package. 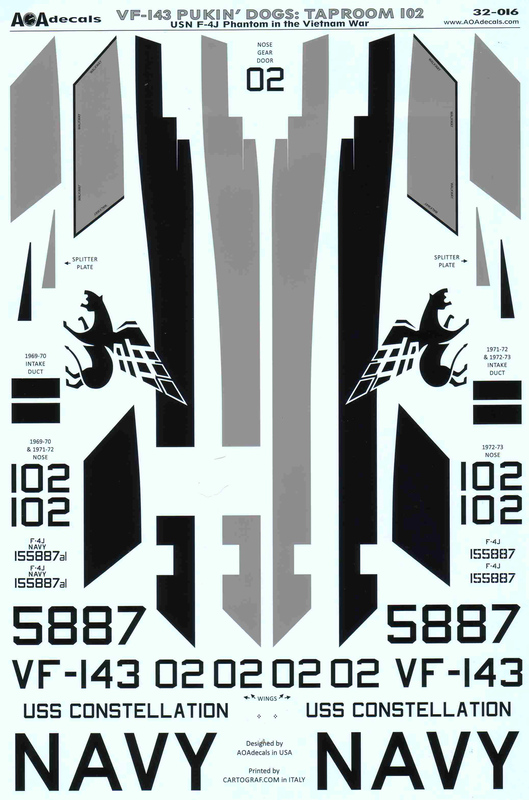 First, you get two decal sheets covering all the needed markings to complete one of the three cruise markings. The sheets are large and beautiful and printed by Cartograf. Perfectly registered and well labeled also. 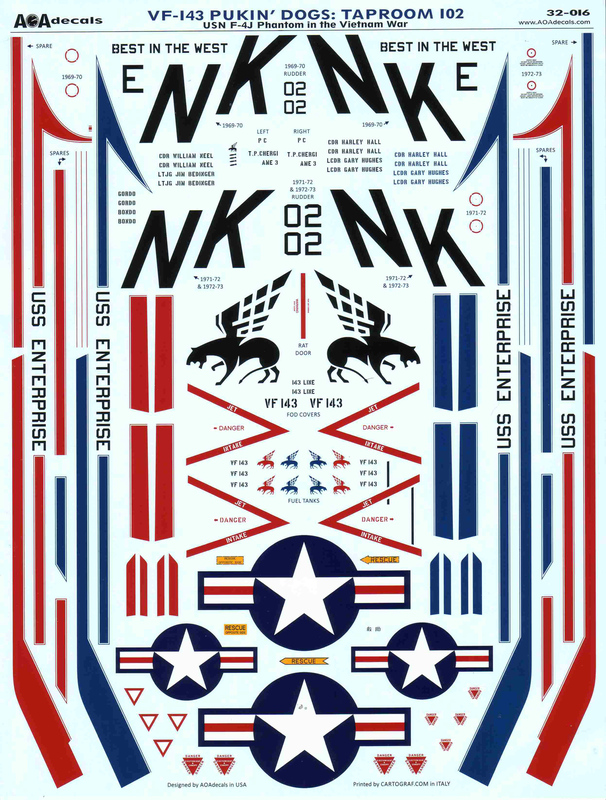 One thing to note, all of the massive stencils found on F-4's are not included to minimize the size of the sheets. Secondly, you get three full color sheets covering all the history and the profiles for all aircraft. 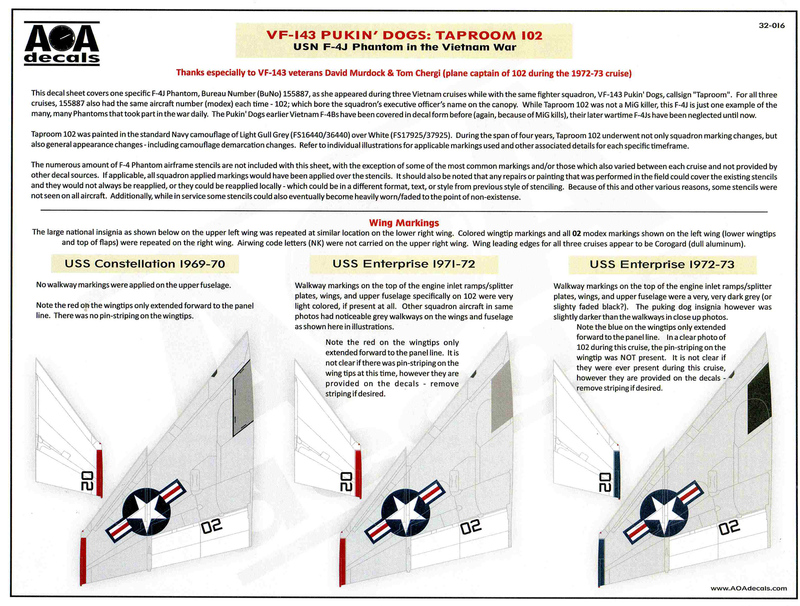 One page contains details and all the needed wing markings. The second double sided sheet covers the profiles for each aircraft for the individual cruises. Each profile has fantastic detail about markings, location of the decals, plane color and little specifics like the color of the smaller details. AOA dedicates this decal sheet to the honor/memory of Capt. Hall. To insure accuracy, they enlisted the help of VF-143 veterans David Murdock and Tom Chergi (who was the plane captain during the 1972-73 cruise). In fact, the cover photo was from Mr. Chergi. All I can say is wow! These decals are well printed, completely researched, and just plain outstanding. Highly recommended. 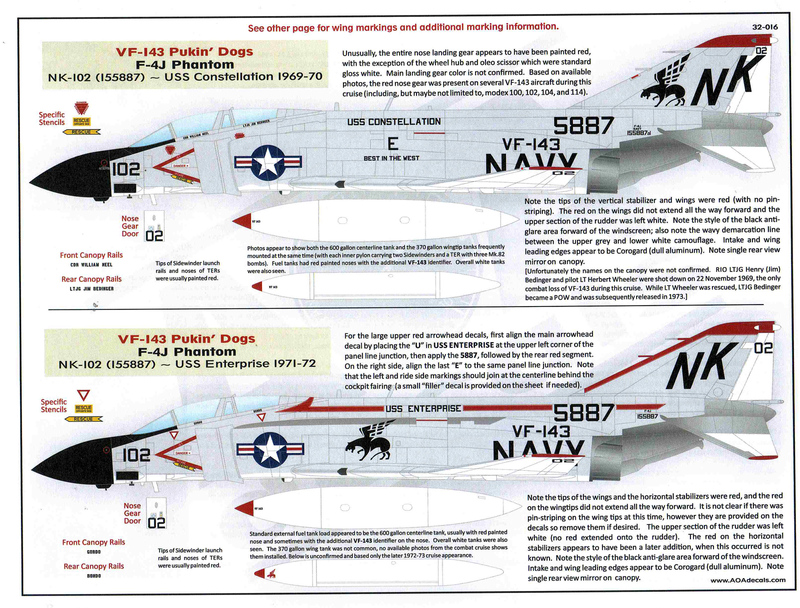 If you are building and F-4, these decals deserve your review. My thanks to the fine people at AOA Decals for the opportunity to review this superb set. 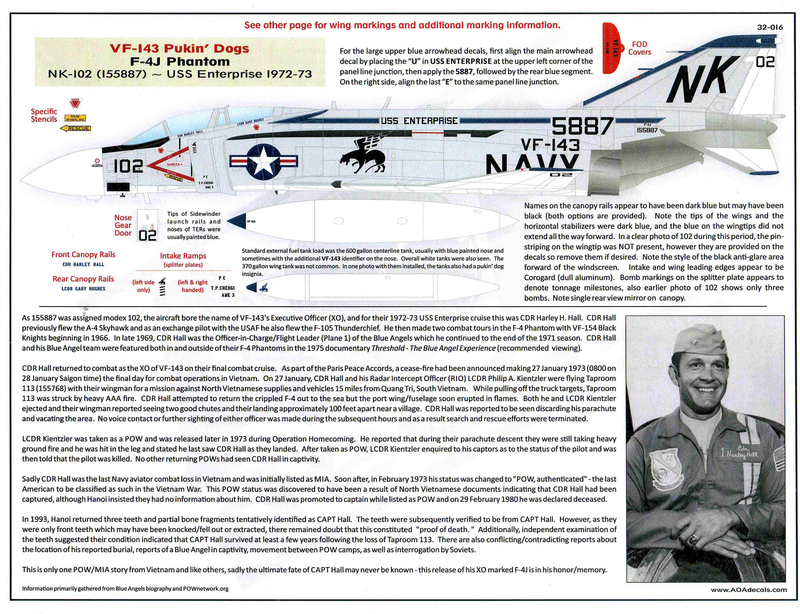 "Taproom" 102 decal position descriptions for 1972-73, with a detailed description of the fate of CDR Harley H. Hall.